Considering the distance between the modern reader and Homer, Fagles’ translation of Homer’s Odyssey is a very accessible easy-read adventure tale, that ay be light on direct action for some, but has definite narrative energy through its framed story-telling. 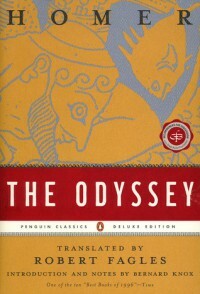 There is historical and cultural interest on a theory level, particularly in the often repeated oral-story-telling devices: when Odysseus is stressing about the occupants of a new unknown island he’s about to land on, for example, and is wondering if the occupants will be friendly or not, human or monster, the ‘eating of bread’ is a feature, placing the ability to produce bread as an intrinsically social and humanistic act: that those groups of people that are capable of this act are the kind that will also be moral and caring. This is obviously a canonical work of literature, an example of how we began to understand ourselves and think ourselves into the human condition that we enjoy today, so much can be said about it on this level, and has been many times, including in the excellent introduction of this translation by.